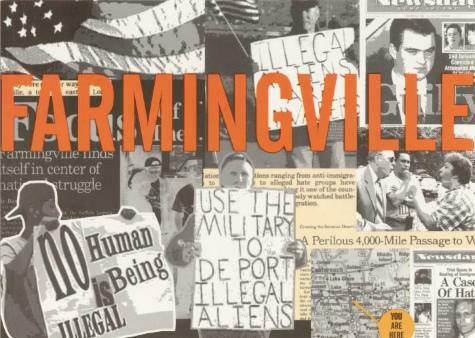 Camino Bluffs Productions' postcard promoting the Farmingville documentary with a collage of black and white images from the film, and including a list of the directors, producers, editors, with contact information and credits on the verso, ca. 2003. Source: Hofstra University.The Farmingville Collection, 1996-2005. Box 35, Folder 35.